We know well that styling hair so often can damage hair. Flat irons, hair dryers and curling tools damage the upper layer of hair strands and make it look dull and damaged. But you love those curls; what should you do to prevent damage with these tools yet get those stunning curls? Straightening naturally may be difficult but not curling. You can get curls in a span of few hours or overnight; how? Here are few tricks to curl your hair without heat. This is an easy way to get awesome curls overnight. All you need to do is take a band and tie it round your forehead area firmly. Start with a section of hair from the hair on one side. Wrap it up into the band carefully and bring the section downwards from inside of the band. Now take the next section of hair in the same side and do the same thing. Move towards the backside of your head. Now start with the other side of your face and start wrapping hair sections into the band towards back of your head. Wrap all the hair into it. Take your time and do it gently without messing it up. Don’t forget to use hair mousse to hold the curls for long. Sleep and the next morning gently remove the band and loosen your curls. Your party hair is ready. Twisting gives amazing curls as well. For this you need to take hair sections and twist it inwards or outwards while it’s still damp. You can tie it to keep it in place if required. Leave it till it air dries and then loosen it. This will give you soft waves. If you choose to make more sections of hair then you can have more curls. This can be flaunted as a hair style as in earlier days. Ladies used to curl and pin them and leave it like a hair style but now this is used to curl hair. Those with short hair can curl hair this way. You just need to make sections of hair and wrap it round onto your head and use 1 or 2 pins to keep it in place. Do this while the hair is slightly damp and leave it for few hours or leave it overnight. Next day you’ll see amazing curls after removing the pins. This is another easy method to curl hair easily. Just a take a sock and cut the front part where the it is joined. Now roll it round to make it like a hair band. Comb your hair and make a high ponytail. Take the sock band and start wrapping hair with it in outward direction from the ends of your hair towards your head. Once done, use the mousse to hold the curls and after few hours, remove the band and flaunt your curls. Take few paper towels or a cloth and cut it into strips so that you can tie them to your hair sections. Take a stick, a pencil or something like that and wrap it in a towel strip. Using this, wrap a hair section from the ends towards the roots by rolling upwards. Now gently remove the stick and tie your rolled hair with the towel strip to keep your hair in place tightly. Leave it overnight and remove the strips completely and reveal your curls. Make sure you use the mousse. This gives soft waves but not heavy curls but is easy to do. Take few sections of hair and start braiding. Using a band, tie the ends of the hair to keep them at place. Use a hair mousse to hold the curls. 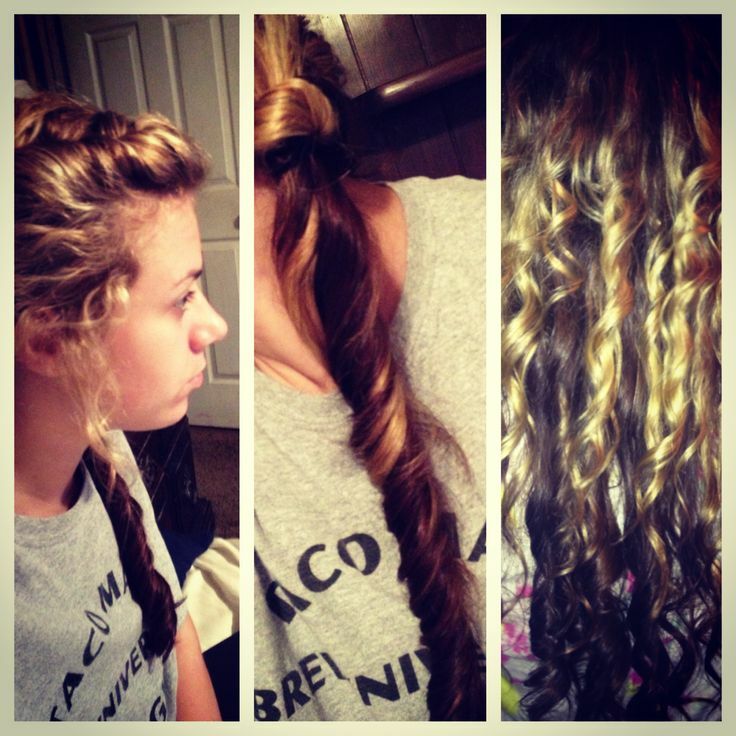 Leave it overnight and the next day, unbraid your hair. If you want slightly heavy curls, you can wrap the braids upwards and fix them with bobby pins. All these tricks work well but make sure to wrap hair tightly to get good curls and use a good hair spray or mousse to hold the curls. This looks so cool, I didn’t know this brand! It’s true, heat can damage hair; mine is very thin (though through pictures people think it’s thick, but it’s not, unfortunately) and heat is not good to it. So sometimes I use the paper towel method, or even newspaper 🙂 and the braids’ one, too. As my hair is wavy, it gets the shape of the curl very fast! I would love to subscribe to your blog of follow on bloglovin, have you considered opening a bloglovin account? It’s easy and it delivers posts to one’s inbox! I really love your blog! This tip is very useful, thanks for sharing! I usually do the braid trick, but I’m going to try the headband one and see how that works too. Do you have to do it on dry hair, or does it work on wet hair as well? I like girls with curls, nice tipsYasmin!